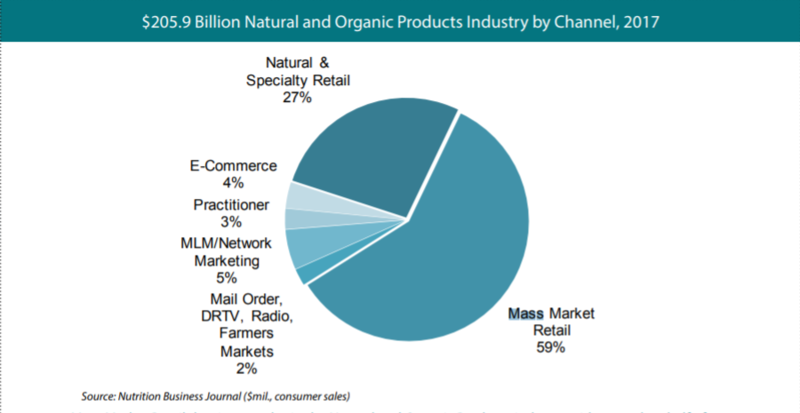 The following is an excerpt from Nutrition Business Journal's new Sales Channel Report, designed to help companies navigate the omnichannel dynamics of today's natural products industry. The no/low growth environment experienced by large-cap food and beverage companies is well-documented. Ninety of the 100 top brands lost market share in the past year, according to Catalina data. But they are not alone in their pain as conventional grocery retail faces considerable challenges as well, particularly from rising online sales. The symbiotic duopoly that for so long governed consumer choice at shelf has fractured. Decades of mutual back-scratching effectively built a competitive moat, but that moat has been breached. Understanding this titanic unraveling requires an exploration of how this historical interdependence effectively dulled both the food companies and grocery retailers to secular changes in the marketplace and created open innovation territory for challengers. It was technological advancements that gave rise to self-service supermarkets—notably Safeway, Kroger and A+P—in the 1930s. The democratization of refrigerators and automobiles was central to a shift to the “stock-up” grocery trip-mission that became the the dominant paradigm for so long. And the consolidation of grocery and food manufacturing largely followed a parallel path with Charles Merrill (later of Merrill Lynch) assembling Safeway Stores beginning in 1926. Meanwhile, the predecessor of Kraft Foods began rolling up the dairy business (with the help of a Wall Street and a public offering), supporting 55 acquisitions between 1923 and 1931. As consolidation and scale economies continued on both sides of this manufacturing and merchandising partnership, so too did the tools of the trade and strategies such as promotional pricing in features and display, control of shelf assortment, category planograms, slotting fees, and other marketing and merchandising techniques that favored the large players. The partnership seemed unassailable, until it wasn’t. While the incumbent leaders were guarding their competitive moat, consumers and their food and beverage preferences changed at a stunning pace, accelerated by the internet and social media. Large-cap CPG largely failed to deliver relevant consumer-driven innovation to its retail partners to drive growth. And retailers have been too passive and patient, not wanting to disrupt the symbiotic arrangements. Early indications of this secular demand shift were drowned out by the noise around the great recession. Many norms got upended during this period. The incumbent strategy was to “wait it out,” as if it was a bad case of the flu, but the recession was something of a head-fake that temporarily masked the foundational shift, led by millennial consumers, surrounding values and preferences in food and beverage. Shifts in household structure—such as later marriages and fewer marriages–have driven meaningful and lasting changes in shopping and eating patterns and behaviors. Now, what were once privileged assets in manufacturing, distribution and retailing often more closely resemble encumbering assets. Perishable groceries make for an extraordinarily difficult online commercial proposition. Online penetration in grocery overall is substantially below more celebrated categories such as books and electronics—and the rate of store closures reflects category penetration. Yes, online grocery will grow meaningfully—and yes, it is an enormous category. Early and expensive experiments may have yielded important learnings, but certainly not profitable business. The Amazon acquisition of Whole Foods Market marks the acknowledgment that Amazon’s core model is inadequate for the grocery business, and they continue to evolve to solve this commercial challenge. Likewise, Walmart’s $16 billion acquisition of Flipkart and the acquisitions of Jet.com and Bonobos are testament to its imperative to succeed in the online marketplace—and with new demographic segments and new geographies. Walmart is certainly not staying in its big-box lane. And the largest private-sector employer in the world may again turn its assets and infrastructure into an advantage as the once category-killing retailer struggles to readjust and redefine itself. Offline, its price leadership model is being challenged by high-growth and more agile Aldi, Lidl and dollar stores. All legacy grocery retailers are struggling with their proper and profitable role in the digital world as online grocery serves to democratizes shelf placement; brands are increasingly bypassing stores altogether in launching new products direct-to-consumer online. Meanwhile, digital native online companies such as Thrive.com, while capital intensive, are not challenged with cultural and infrastructure legacies. And speaking of digital natives, both the millennial and Gen Z cohorts only expand their entitlement to frictionless and cost-efficient shopping experiences across all channels. These cohorts are influential not just based on buying power but also on the influence they have over older and younger generational cohorts. As online transactions become more frictionless, so too are physical retailers obliged to keep pace in innovation while hopefully leading in experience and service. That legacy interests inhibit innovation is apparent in the retail dynamics in China. China has a weak brick-and-mortar infrastructure with 2.4 malls per million population, versus the 12 malls per million population in the United States. China is likewise way ahead of U.S. consumers in mobile payments (11 times) and cheap delivery logistics. Unburdened by legacy retail, China accounts for 57 percent of global online sales. Alibaba’s Singles Day sale on November 11 resulted in over $25 billion in sales–more than double all sales in the U.S. from combined Black Friday and Cyber Monday. Disintermediation certainly refers to elements of the supply chain, like removing a broker or distributor who stands between the producer and the consumer. But, importantly, disintermediation can also reference the rise of peer-to-peer influence and the diminished importance of mass-marketing messages. Consumers have a viable alternative in validating attributes, qualities and preferences in an increasingly personalized manner. So be it specialized diets (paleo, keto, allergen avoidance, etc.) or values-driven choices (organic, ethical veganism, pollinator friendly, local, etc.) these once-fringe niches have, in aggregate, become forces to be reckoned with. For huge global companies focused on portfolios of billion-dollar-plus brands, a $50 million to $100 million opportunity was historically seen as a distraction and dilutive both to margins and to internal focus. Yet, however fractionated these niche market segments might be, in aggregate, challenger brands have been the growth engine in a mature food and beverage marketplace. Not only have they become viable, given peer-to-peer influence and validation, but their success has stimulated tremendous innovation and a robust and rapidly evolving investment ecosystem. The success of challenger brands—and the stunning acquisition valuations—have contributed to a flow of talent and capital unprecedented in the world of entrepreneurial food and beverage companies. Innumerable venture capital and private equity funds, as well as incubators and accelerators, are fueling and facilitating the development and growth of potentially disruptive new products and brands. In most cases, these disruptive products operate outside of well-honed ingredient supply chains and manufacturing infrastructures that are so central to the high-margin operations of large public companies. In one respect, it is an unfair fight. In the absence of growth, public companies are judged largely on earnings-per-share. Thus, the combined Kraft-Heinz enterprise, as managed by 3G Capital, enjoyed a fantastic increase of stock price as it demonstrated the ability to remove significant costs ($1.7 billion) through layoffs, plant closures and other cost reduction methods. Its public company peers, driven in part by fear of becoming the next 3G acquisition target, largely followed suit, cutting significant costs and delivering short-term increases in earnings per share. While Wall Street initially rewarded these efforts, Kraft Heinz, General Mills, Kellogg, Campbell and others have been materially punished in 2018, largely on the failure to deliver growth through inadequate product and market innovation. Wall Street is impatient. But at the same time, large-cap CPG has largely failed to make a compelling case for reinvestment in innovation and long-term growth. This failure accrues both to executive leadership and boards of directors—so don’t blame the assistant brand managers. Meanwhile, venture- and private-equity-backed food and beverage companies operate under a different risk paradigm and are largely exempt from producing frothy gross margins and net profit. Instead, top-line growth is the holy grail—that is what the incumbents are desperately seeking to acquire. Large-cap CPG companies have been unable to successfully keep up with marketplace dynamics. Suffice it to say that at this point there is some realistic capitulation on their part of as to limitations on delivering innovation and growth. Thus, as one manifestation, virtually every major player now has a corporate venture capital unit responsible for attracting and nurturing entrepreneurial talent and product ideas that can help fill the growth gap. Facebook has recently joined the ranks of large institutions experiencing faltering trust in their brand. Millennials are notably less trusting, and Big Food and ag do not generally fare well with this cohort. While enormously efficient at producing inexpensive, shelf-stable and food-safe products, the industry has fallen out of touch with consumer demands for ingredient integrity, nutritional density and less processed foods. And in serving the interests of their members, industry trade groups have conspicuously ignored consumer demands for greater transparency and integrity. Examples include blunting the right-to-know about genetically modified ingredients, and lobbying efforts to prohibit NAFTA trading partners from prominently labeling foods that may be unnaturally rich in sugars and fats. A variety of structural and cultural factors limit the ability of big food and beverage companies from keeping pace with consumer attitudes. The business instinct to protect legacy gross margin structures makes it also logical to protect the incumbent supply chain, continue to value-engineer products, and to fully utilize existing assets. The historical 18-month brand management deployment cycle ensures that just as marketers are gaining some intimacy with their target consumer, they move on to the next brand or position in service of their career development. The senior leadership in most of these companies does not resemble the essential emergent consumer cohorts. The moniker of a B2C should perhaps be flipped to C2B in recognition of the consumer prominence in this business relationship. Big Food and Big Ag seem reluctant to accept that the consumer decides! And consumers increasingly choose to patronize purposeful brands. And finally, the role of the brand is evolving. Millennials are selectively brand loyal, but they are also very experimental and more attentive to peer endorsement than top-down marketing messages. In this context there has been both growth and material quality improvement in private label offerings serving to partially displace incumbent brands. Private label is no longer just about cheap but can also be a comprehensive quality and value equation. And it is not just about interesting new private label offerings (Thrive, Brandless, Lucky’s—and watch out for Amazon) but often about private label-driven store banners like Trader Joe's. Especially as online grocery increases its share of the marketplace, an already saturated retail environment becomes untenable. Brick-and-mortar grocery retail is absolutely not going away. The situation is not nearly as apocalyptic as it is for department stores and apparel retailers. But there is too much store space, as space has been added at twice the rate of population growth in the past two decades. And the configuration of existing formats is not reflective of changing household structures and shopping and eating patterns. Declines in the casual dining segment is a harsh reminder of the consequences of formats ceasing to evolve. Nor is the product assortment optimized. How many different versions of pasta sauce, for example, can be supported in any rational economic model? The nature and ratio of different shopping missions suggest fewer “stock-up” shopping trips and much more frequent and spontaneous store visits in service of immediate to near-term consumption requirements. The trend toward fresh and lesser processed foods certainly contributes to this trend as well. In addition to eating on the go, millennials are eating fewer meals in favor of increased snacking occasions. And as aggregate food demand is essentially inelastic, the combination of meal kit home delivery, increased consumption at foodservice and the rise of online grocery retail all conspire to challenge incumbent banners and formats. Certainly, there are excellent examples of incumbents investing in and experimenting with alternative formats (Kroger→Lucky’s; Meijer→Fresh Thyme; Walmart→Jet), yet the large public market leaders are significantly underperforming the S&P 500. At one point in the 1930s, A+P had over 15,000 stores, a mail-order business, rural delivery, and a vertically-integrated private label manufacturing. Their dominance stimulated anti-competitive legislation proposals as “mom and pop” stores could not compete with A+P discount pricing. Sound at all familiar? Once dominant players are simply not guaranteed a future leadership position. No matter how deep they dig the moat. John Grubb is managing partner at Summit Venture Management. 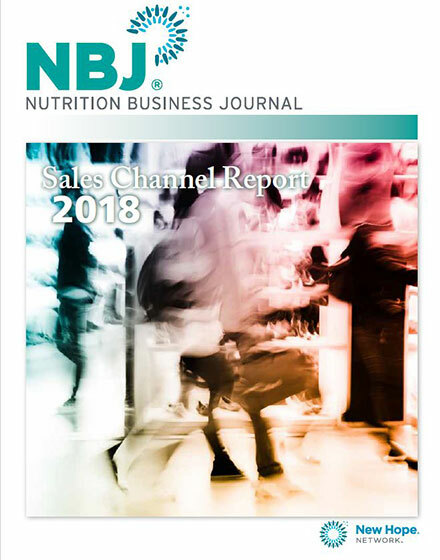 Dive into detailed data that tracks where different product categories are selling and insight that will bring executives up to speed on ever-evolving omnichannel dynamics in the Nutrition Business Journal Sales Channel Report.